Meditation and Fitness Classes take place in the Dance Studio on a first come, first served basis and are included in your general admission ticket! Manali Haridas-Scott Manali is a Spiritual Wellness Coach and owner of Zen for You. She is a Certified Nutritionist/ Naturotherapist, Personal trainer, Certified Yoga instructor, Reiki Master Teacher and a Motivational Speaker with extensive experience in the field of clinical, sports and holistic nutrition, fitness, healing and speaking engagements with over 20 years of coaching experience. Manali has globally impacted many people’s lives helping them to achieve happiness, positive mindset and work-life balance by her Reiki healing, Nutrition, Yoga & Spiritual Coaching. 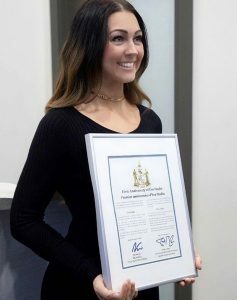 Jessica is a yoga instructor, personal trainer with over 10 years of experience in the fitness industry.She is a Fitness and Health Promotion graduate from Algonquin College with many certifications under her belt including her Healthy Eating and Weight Loss Coach with CanFit Pro. Since becoming a trainer, she has worked with people from all walks of life, she’s competed 9 times winning several titles and coaching many other successful competitors and she has run her fair share of bootcamps, including the Parliament Hill Bootcamp since it was founded in 2015. After seeing how small changes made a big difference in her life, Tania wanted to help others live a healthier, happier life. Through her own life experiences, training, expertise as a Certified Health & Wellness Coach and Certified Meditation Instructor. Tania will help you make small, easy changes that will make the biggest impact on your life today and will last a lifetime. Melissa Bourdeau is Owner & Founder of Evo Studio, located in Orleans, Ontario.She holds certifications in Movement & Mobility, in Functional Range Release, in Yoga Tune Up and Yoga (200Hrs), as a Personal Trainer and in ELDOA Level 2. Melissa is passionate about health and wellness.She has been changing people’s lives in both their emotional and physical states and helping others for multiples years. From people suffering from pain, to professional athletes, to anyone simply wanting to move better and get stronger, Melissa works with them to make them feel better.